Roulette may seem like a simple game with a straightforward mechanism. It has a wheel with numbers on it, usually, up to 36. Sometimes, it features more than one zero. Apart from the American variation with 0 and 00, there are insane types of a triple-zero game. The most common version, though, is still the European one, which has a single zero sector. How many numbers are there on a roulette table depends on the game variation. Actually, it’s not that simple with numbers on the wheel. It gets rather complicated once you start noticing how the numbers are arranged. To start with, adding all the numbers will bring the result of 666, which is believed to be the devil’s number. There’s even a theory that any calculations will bring you to the number 6. There are red and black numbers on the wheel. The arranging logic comes down to alternate the numbers as much as possible. Even and odd numbers aren’t situated together, as well as high (from 19 to 36) and low (from 1 to 18) ones. When a player, for example, bets on 2, and the ball hits 3, it may seem like a near miss, but in fact, those numbers are located quite far from each other. The sequence of numbers differs depending on the version. American roulette has another order and slightly smaller pockets (since there is one more section with 00). 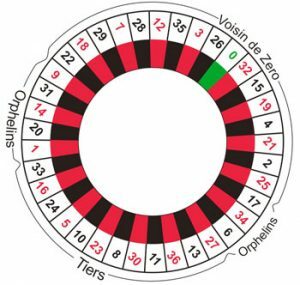 Calculating how many numbers on a roulette wheel you can choose from is easy: 37 if there’s only one zero and 38 if there are two. It’s important to understand that no number is statistically proven as the lucky one. You may hear some thoughts on 23 and 24 being the sectors you naturally glance at, or you may notice that 7 is a favorite number of many players, but none of these has something to do with winning chances. The odds are the same for any number you would place. Before playing roulette, make sure you understand its probabilities and explore payout table to learn which types of bets are the riskiest and most profitable. Even-money wagers (on the color, even/odd, high/low), together with choosing columns or dozens, are considered to be the safest option at the roulette table. Their payouts are 1:1 and 2:1 respectively, while the odds are 48.65% and 32.43% for single-zero versions and 47.37% and 31.58% for double-zero types. Wagering on certain areas of the wheel (there are “called bets” based on wheel sectors, which are not available everywhere) is also taken as one of the most reasonable ways to play roulette. No matter which numbers or their groupings you would select to bet on, there are no best numbers in roulette. No specific action will guarantee you great returns. It all depends on luck. Knowing how many numbers roulette features and realizing the odds of each wager type, you can make the most of playing.